Do They Know It's Christmas?" is a song written by Bob Geldof and Midge Ure in 1984 to raise money for relief of the 1984–1985 famine in Ethiopia. 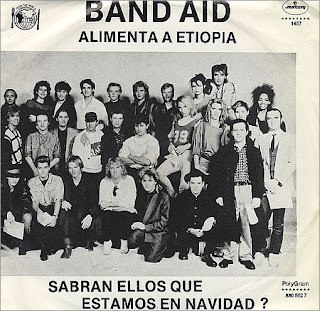 The original version was produced by Midge Ure and released by Band Aid on 29 November 1984. In late 1984, a BBC report by Michael Buerk was aired highlighting the famine that had hit the people of Ethiopia. Irish singer Bob Geldof saw the report and wanted to raise money. He called Midge Ure from Ultravox and together they quickly co-wrote the song, "Do They Know It's Christmas?". Geldof kept a November appointment with BBC Radio 1 DJ Richard Skinner to appear on his show, but instead of discussing his new album (the original reason for his booking), he used his airtime to publicise the idea for the charity single, so by the time the musicians were recruited there was intense media interest in the subject. Geldof put together a group called Band Aid, consisting of leading Irish and British musicians who were among the most popular of the era. The 1984 original became the biggest selling single in UK singles chart history, selling a million copies in the first week alone. It stayed at Number 1 for five weeks, becoming Christmas number one, and sold more than 3.5 million copies domestically. It remained the highest selling single in UK chart history until 1997, when Elton John's "Candle in the Wind 1997" was released in tribute to the late Diana, Princess of Wales, which sold almost 5 million copies in Britain. 1-) Do They Know It's Christmas? (1984 version). 2-) Do They Know It's Christmas? (1989 version). 3-) Do They Know It's Christmas? (2004 version). HAPPY NEW YEAR!! !// FELIZ AÑO NUEVO!! !